Hailed by Rolling Stone as “the most effervescent and soulful girl group anyone has seen since the Supremes,” five-time Grammy Award winning supergroup TLC has seen phenomenal fame and success. 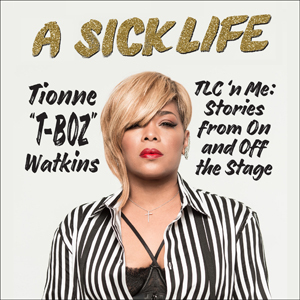 But backstage, Tionne “T-Boz” Watkins has lived a dual life. Read the full description. Watkins is the lead singer of the bestselling female group TLC, known for their singles, “Waterfalls,” “No Scrubs,” “Creep,” and “Unpretty,” which all charted #1 on Billboard. Tionne is a national spokesperson for sickle cell disease. She lives in Los Angeles with her daughter, Chase, and son, Chance. Put the word “TBoz” in the subject line. Entries must be received by September 30, 2017. Open to US only. Congratulations to Debra Cantaluppi, winner of last month’s giveaway, The Lauras. Thanks to all who participated.